DAX is a fully managed caching service that sits (logically) in front of your DynamoDB tables. It operates in write-through mode, and is API-compatible with DynamoDB. Responses are returned from the cache in microseconds, making DAX a great fit for eventually-consistent read-intensive workloads. 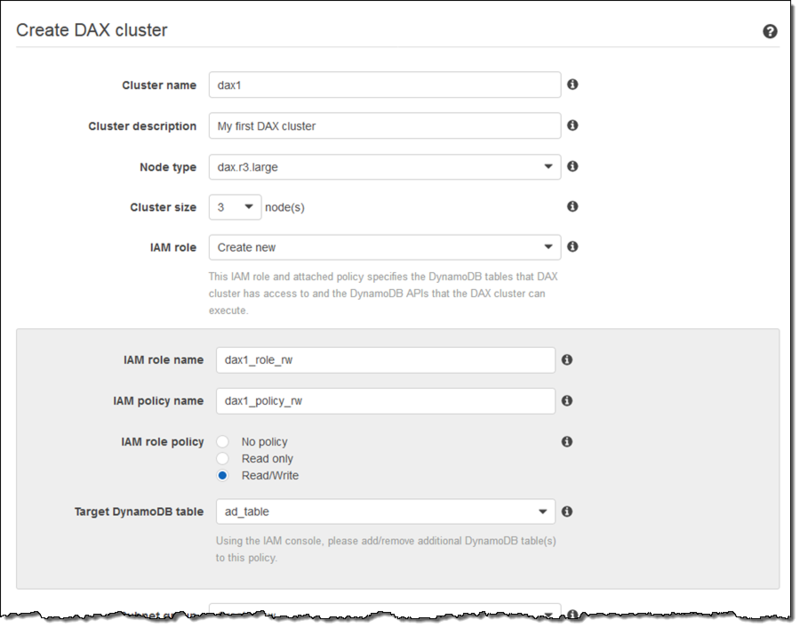 Each DAX cluster can contain 1 to 10 nodes; you can add nodes in order to increase overall read throughput. The cache size (also known as the working set) is based on the node size (dax.r3.large to dax.r3.8xlarge) that you choose when you create the cluster. Clusters run within a VPC, with nodes spread across Availability Zones. This entry was posted in AWS, Cloud, Computer, Database, Murmuring, Network, Software and tagged accelerator, amazon, api, aws, cache, cloud, consistent, dax, dynamodb, eventually, memory, r3, read on April 20, 2017 by Gea-Suan Lin.